Dennis Fitzgibbons was born in 1950, and grew up in Randolph, MA and Millis, MA, near Boston. He describes his childhood as “The Beaver” from “Leave It To Beaver.” Fitzgibbons is a disability rights advocate and serves as the Director of Alpha One Independent Living Center in South Portland, ME. FITZGIBBONS: I hate to put the onus on people with disabilities, but the general public is not going to wake up tomorrow and say, “Gee, let’s go out and include people with disability!” What I’d like to do is create some system where we can encourage people with disabilities to get involved in their own community. That’s how you change people’s hearts and minds, is by being someone who is known. NARR: Not many people would want to relive their childhood, but Dennis Fitzgibbons said his was perfect. He was the Theodore “Beaver” Cleaver of Millis, Massachusetts. FITZGIBBONS: Well, I don’t know how many people always can relate to this, but I often tell people that if they ever watched Leave it to Beaver, I could have been T he Beav. It was a very simple life. It was that quintessential 50s growing up period where everybody in town knew each other. It was a small town. NARR: Dennis grew up in a time when there were three channels on the TV and kids didn’t have to be home until dinner time. He attended Catholic School and was a Boy Scout. He wanted to be a Forest Ranger when he grew up and in the meantime was a stock boy at a local grocery store. In 1968, Dennis started college, but would skip class to be at the grocery store. Soon he dropped out of school to work full time. Since this was in the middle of the Vietnam war, losing an education deferment meant you could be drafted into the service. FITZGIBBONS: So I was eighteen, it was 1968. Things were really rocking and rolling in Vietnam and everyone had a fear about going there. Can’t say that it was a big fear for me. I didn’t really want to go, but at the same time, I was immature and not really thinking about those kinds of consequences. NARR: What happened instead changed Dennis’s life forever. FITZGIBBONS: When spring came that year, several of us went off for a day of fun to the beach and stuff like that. On the way home, we were in a car accident where everybody in the car was really messed up, including two who were killed. It was a disastrous event for several people. I had torn colon, punctured diaphragm, broken back and spinal cord injury. NARR: For a week, Dennis was in a coma. For months, he was flat on his back. His spinal cord injury was such that he was paralyzed from the waist down. Most people would be devastated by this news, but Dennis stayed positive. One nurse made a big difference early in his recovery. FITZGIBBONS: I remember one particular person was a male nurse there. He made a big impression on me in terms of what he said I could still do. I find it amazing to look back now with the positive energy that I receive from people that most people don’t get anymore in rehab. But from the very beginning, he would come in, he would be cheery. He would talk. He would ask how I was doing. And he would just say, you can still work, you can still have a family, you can still do this, you can do that. It was just never any doubt expressed by him. Other people weren’t expressing it either when it came to the professionals, which was reassuring for me. I hadn’t even started to think about that on my own, but it never struck me that not being able to walk again was going to hold me back. So, it was kind of a fascinating take because nowadays, it’s not unusual for someone in my position to be told, don’t go back to work. Collect SSDI [Social Security Disability Insurance]. Don’t wear your body out trying to do those things. So, it’s a whole different message. It’s the wrong message, but I’m fortunate I got the right message right from day one really. Really helped me in terms of not for one moment thinking that I wasn’t going to recover and have a full life. NARR: Since then, Dennis has spent most of his life since the accident making sure that other people with disabilities can have full lives as well. When the Americans with Disabilities Act was passed in 1990, Dennis saw it as one way to enforce equal rights and equal access to employment, transportations, and businesses. FITZGIBBONS: The more I learned, the more excited I was, as was everyone else, because we thought, this is going to be huge. We’re going to have such greater access to things and greater inclusion that everyone was looking to jump on the wagon for different things. People can be productive, they can give back, and they can be trusted to do the work anyone else can be doing. 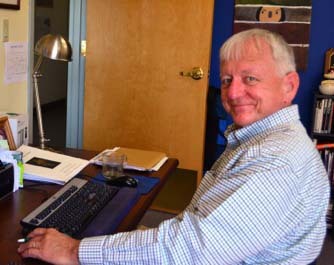 NARR: For almost 20 years, Dennis has been the Executive Director of Alpha One, A Center for Independent Living. He has fought for access to adequate health care, loans, education, public spaces, and employment for people with disabilities. But there’s still a long way to go. There is a lack of awareness among the able-bodied for the disability rights movement, although every one of us will be impacted in some way, at some point by disability. FITZGIBBONS: Now, it’s like we’re all Peter Pan and we all think we’re going to live forever and we’re all going to have strong, healthy bodies and we’re going to be models and things like that. That’s an image that very few of us can live up to. It’s just not the norm. I don’t think people really look at disability as the norm, but it is. You can be born with a disability, as people are, and as you said, as we get older. There’s a good chance they will acquire a disability or more than one. It’s just the natural way of life. But there’s so much denial about staying young, staying beautiful and all the things like that, that people really consider disability worse than death. When I was injured way back when, I remember people saying, gee, if that happened to me, I would have killed myself. I would say, why? I’ve always said it and I still say it. I’ve had a great life. I have no complaints. I’ve worked most of my adult life. I’ve got a family. I’ve got kids. [I] got a great job. I have great friends. I’ve had great opportunity. I’m still having fun. So, why would you not want to have that? Jokingly, I’ll say, walking’s not all it cracked up to be. FITZGIBBONS: No one ever gave me a list of what you cant’ do. That was really helpful for me because I d never been one to hang around. I’d never been one to accept limits. Then, I just went out and tested my limits to find out what I could and couldn’t do. I found I could do a lot more than people expected me to do. NARR: I’m Keith Ludden. This segment of our series on the 25th anniversary of the Americans With Disabilities Act was recorded, written, and produced by Molly Graham. Our series is funded in part by the Maine Humanities Council, in partnership with the Maine Arts Commission, Oral History and Folklife Research, Alpha One Independent Living Center, WMPG, and the Disability Rights Center of Maine.